When's the last time you changed yours? When it comes to owning a home, there's a laundry list of things to keep tabs on. And like we do with our cars, we tend to avoid regular maintenance and check-ups, but I'm here to say that you shouldn't do that, with either one. After all, our homes provide us with shelter from the elements, offer us a certain level of safety, and give us a space for our most prized possessions. I mean, the least we can do is take a few extra steps to protect it, and there's nothing more overlooked than the furnace filter. 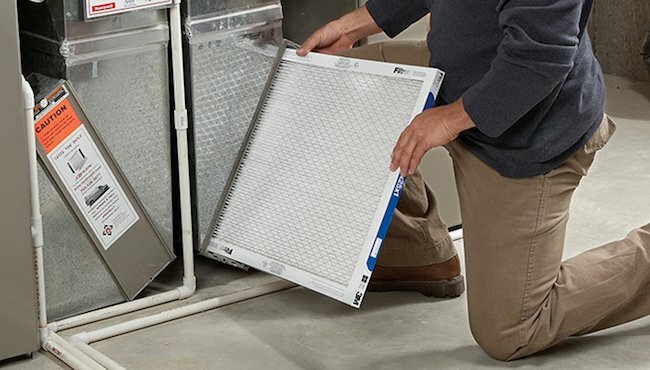 So why is it important to change your furnace filter? Just like someone with asthma has to work harder to breathe, dirt and other particles like dust, pet dander, and pollen get trapped in the filter and constrict airflow causing the furnace to work harder for longer. Over time that could cause your furnace to wear out sooner and you'll have a much larger bill (approximately $3,000) on your hands. The other benefit is that the air quality of your home will be much better. The EPA has estimated that the indoor air quality of your home can contain up to five times more pollutants than the air outside, meaning if you or somebody in your home actually suffers from asthma, changing the furnace filter is even more important. Now, only one question remains: How often should the furnace filter be changed? We spoke to the experts over at Done Plumbing & Heating, who recommend changing the filter at least once per month. Not sure what size you need? Just give them a call! What are your thoughts? Any HVAC experts have any tips? If so, let us know in the comments below! Want to hear more about what's going on in Colorado? Have you ever driven on one of Colorado's most dangerous roads?